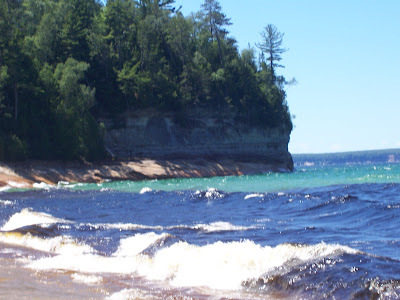 The winds were up a bit yesterday on Lake Supeior when I paddled through the Pictured Rocks in the Upper Peninsula, but myself and other kayakers braved the waves and found some stunning views. It was a crystal clear day, although a bit cool. The best trip on rough days is to put in at Sand Point near Munising. From there you can paddle across the channel to Grand Island or follow the Pictured Rocks to Miner's Castle. The island buffers paddlers from the waves from the big lake. Yeah, it was pretty windy on Newburgh Lake yesterday evening.